The staff was friendly and the rooms are nice. The view of the river off of the balcony was really enjoyable. Three mattresses are all too soft. We felt a little uncomfortable. Where to find Wenatchee - Lake Chelan hotels near an airport? Where can I find hotels in Wenatchee - Lake Chelan that are near tourist attractions? Even though there are no Expedia hotels in Wenatchee - Lake Chelan, there is one accommodation option that is within a 0.1-kilometre (0.06-mile) radius. However, 130 kilometres (79 miles) from Wenatchee - Lake Chelan is Moses Lake, which has a number of Expedia-listed hotels and apartments. 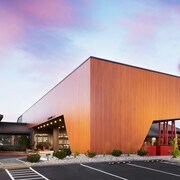 These include Comfort Suites Moses Lake and Holiday Inn Express Hotel & Suites Moses Lake. 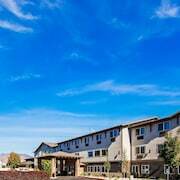 Accommodation in Wenatchee which is 65 kilometres (42 miles) away include SpringHill Suites by Marriott Wenatchee and Holiday Inn Express Wenatchee. Leavenworth, roughly 55 kilometres (33 miles) from the heart of Wenatchee - Lake Chelan is home to Alpen Rose Inn and Fairbridge Inn & Suites. If you have very few wishes and are simply after the most affordable Wenatchee - Lake Chelan places to stay, there are quite a few affordable lodgings to choose from in the area. 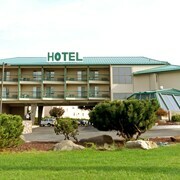 The Howard Johnson Express Inn - Leavenworth is 55 kilometres (34 miles) from the heart of Wenatchee - Lake Chelan, while the Alpine Rivers Inn is 55 kilometres (33 miles) away. 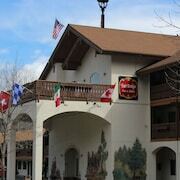 Other lower-cost room options include the Obertal Inn and the Best Western Chieftain Inn. 20 kilometres (13 miles) away from the heart of Wenatchee - Lake Chelan, is the Mountain View Lodge & Resort. Interested in seeing more of the mountains and gorges this area features? Why not spend a few nights in other destinations in Central Washington? You could travel to local sights or have a go at rock climbing, hiking and camping and afterwards book a convenient hotel to stay the night. 50 kilometres (32 miles) from Wenatchee - Lake Chelan you'll find Winthrop, where visitors can enjoy Big Twin Lake and Mack Lloyd Park. Should you wish to spend a night or two in Winthrop, check out the room rates at the Hotel Rio Vista and AbbyCreek Inn. 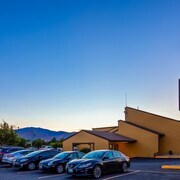 95 kilometres (59 miles) to the southeast of Wenatchee - Lake Chelan, you can also stay at Quincy, which is home to the Knights Inn Quincy and Sundowner Motel. The North Park and Colockum Ridge Golf Course are a couple of the most popular attractions to check out while in Quincy. Searchfor Expedia's Wenatchee - Lake Chelan travel listings and explore the great things to experience that this part of the world offers. What are the most popular Wenatchee - Lake Chelan hotels? Are there hotels in other cities near Wenatchee - Lake Chelan? 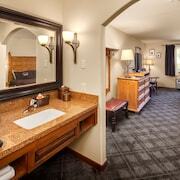 What other types of accommodations are available in Wenatchee - Lake Chelan? Explore Wenatchee - Lake Chelan with Expedia.ca’s Travel Guides to find the best flights, cars, holiday packages and more!